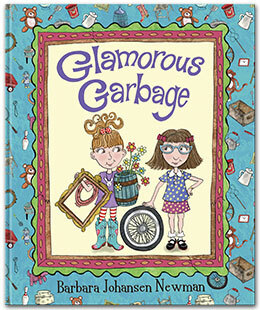 Glamorous Garbage by Barbara Johansen Newman is a picture book for early readers with fun illustrations about a girl who can't part with any of the things that have come into her possession. And she can't organize them, either. After getting an ultimatum from her mother, she has to give some thought to doing something about the mess. Instead of getting to work, she starts collecting "glamorous garbage," items other people are getting rid of. She insists she has a plan for them. The book begins to introduce the idea of a reduce and reuse lifestyle. 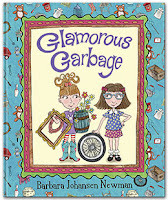 That aspect of Glamorous Garbage is subtle, coming across primarily in the illustrations. The child dealing with a messy room, and why she should, is a much stronger part of the story. Most of the environmental picture books I find deal with children observing the natural world outdoors or living within it in some way. This book is different in that it deals with how people live in their homes. It would be a unique addition to an environmental reading list. Catch an interview with Barbara Johansen Newman on writing Glamorous Garbage, other Glamorous books, and her work in general at Lupine Seeds.